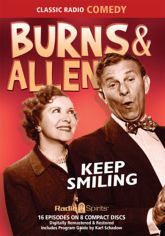 Logically illogical -- that's Gracie Allen! And you can imagine what that means for her long-suffering husband George Burns! Here are sixteen laugh-packed adventures with the People Who Live In The Burns House, co-starring announcer Bill Goodwin, musical director Meredith Willson, and Mel Blanc (as the Happy Postman)! Listen along as Gracie encourages George to get more romantic and discourages his singing. These digitally restored and remastered shows - many of which have not been heard since their initial broadcast more than fifty years ago - feature visits by a number of curious callers, including Charles Mortimer (the future president of General Foods) and NBC vice-president Sidney Strotz!